Ever get tired of chocolate? Even I get tired of chocolate sometimes. I know, that seems impossible, but it happens. That’s where this drink comes in. I like vanilla almost as much as I like chocolate – more so in some cases. I prefer vanilla ice cream over chocolate. And when it comes to hot drinks, this white chocolate is at least tied with its chocolate counterpart. Is it a little late in the season to be posting a hot drink? Maybe. Or maybe not. I enjoy hot drinks all year round. The reason I’m posting this recipe now is because it goes along with my 5-ingredient recipes kick (click here to view more 5-ingredient wonders). This drink is super-simple to mix up, and it makes a great evening drink because it doesn’t have chocolate in it. If I make this for a nighttime snack I’ll often add a half scoop of protein powder and some glucomannan to thicken it into a more filling light snack (I’ll often omit the cream if I do this because the protein powder helps make the drink creamy by itself and I try not to consume too many calories before bedtime). In the mood for chocolate? Check out the 5-ingredient chocolate version of this drink here. Or my more involved yet more filling Fuel Pull hot chocolate. 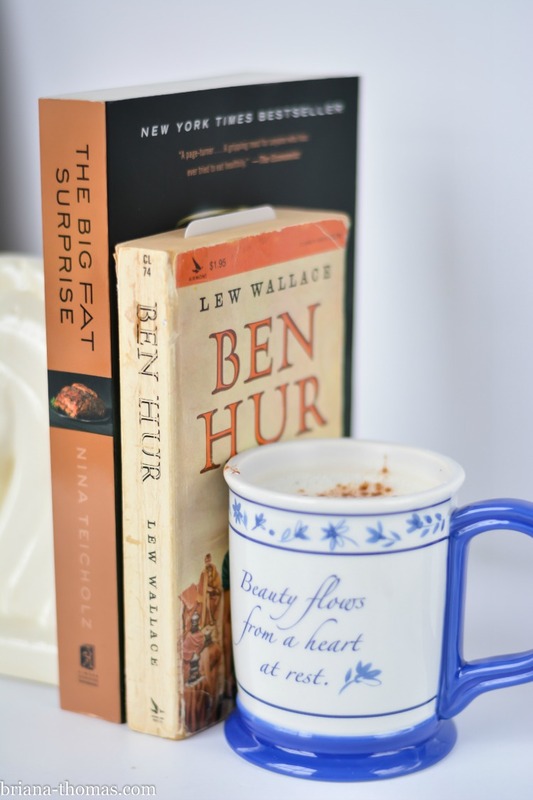 Hot drinks just seem to go hand-in-hand with book-reading, so I photographed this white hot chocolate with two books that I’m currently reading: Ben Hur and The Big Fat Surprise. I’d also like to give a shout-out to my friend Katy for giving me the gorgeous mug you see here. Thanks, Katy! You can pin this post by clicking the “Pin it” button on any of the images, or you can snag my official pin here. Pour a little almond milk, the cream, salt, and vanilla into a mug and whisk it together until frothy. Fill the mug up the rest of the way with almond milk (or part water, if you're frugal, but this won't be as rich). Microwave for approx. 2 minutes (you could heat this on the stove as well). Whisk in the stevia (doing this after heating keeps the sweetness from dissipating). Enjoy! 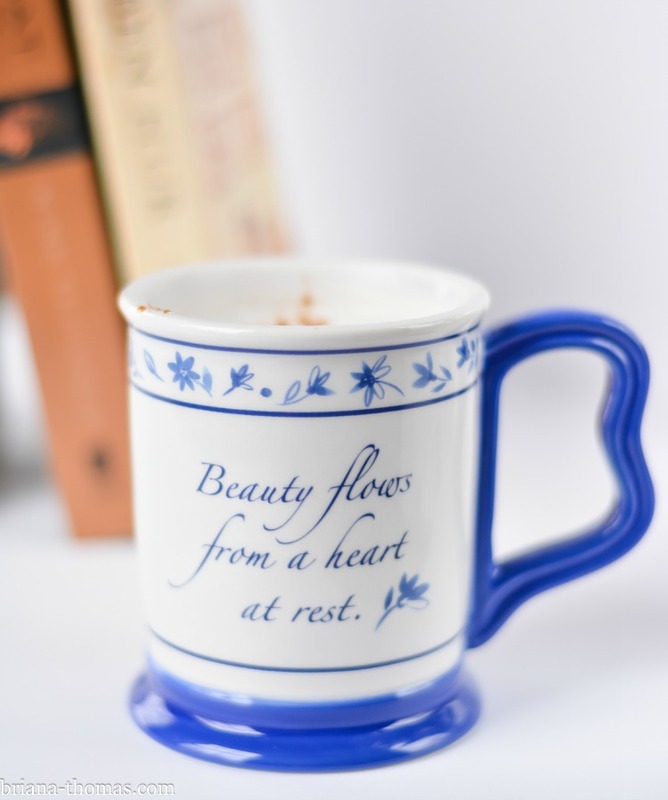 Tweak things to your taste; amounts will vary depending on the size mug you use. Made this and added a dash of peppermint extract, as well as a half scoop of THM integral collagen, soooooooooo yummy and satisfying. I am supposed to avoid cocoa because of my kidney stones, so this is my new go to instead of hot cocoa! Thank you Briana! Those sound like great additions, Jessie! I’m glad you liked it! 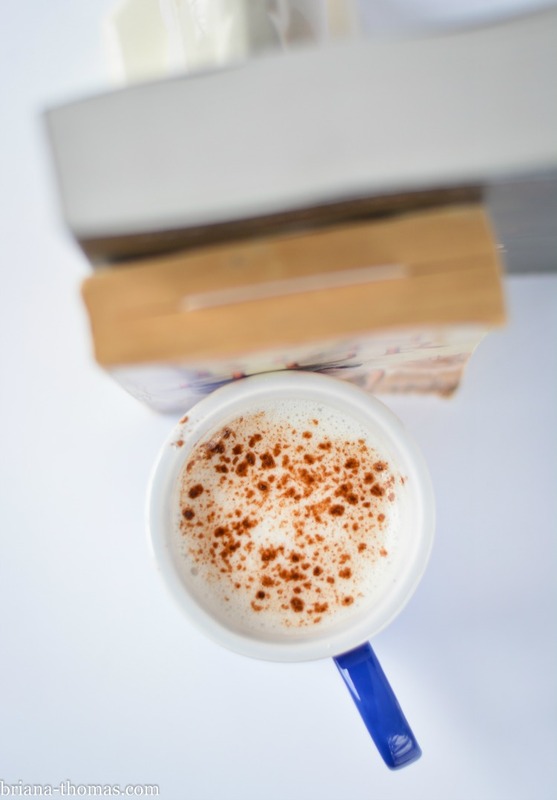 I haven’t been able to get warm this afternoon, so I decided to try your white “hot chocolate” recipe that I came across this morning. I added what I thought was a dash of caramel extract, because I thought salted caramel sounded good. To my horror, I added mint extract! Let me tell you, it was an excellent mistake to make. Creamy, minty, deliciousness. Thanks for such a simple recipe! Thanks for sharing that, Amber! Sounds delicious! Briana, thank you for this recipe! It tasted exactly like white chocolate, and I loved it. It was easy and delicious. Thank you so much. I love reading your cookbook! So colourful and beautiful. Love the pictures and the descriptions of each recipe. Wonderful! I’m so glad to hear that, Jane!